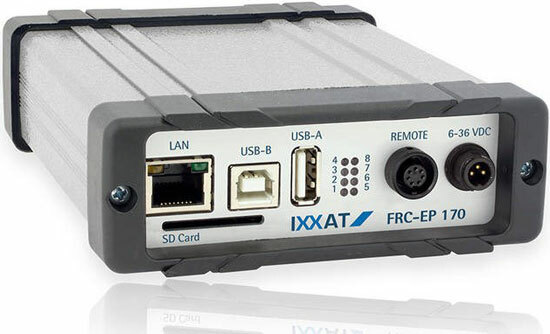 The FRC-EP170 and the FRC-EP190 from HMS/Ixxat are universally usable hardware platforms for applications on the test bench or in the vehicle. Besides others, the devices provide Classical CAN and CAN FD interfaces. Expansion slots enable to add other interfaces, including WLAN, GSM, or GPS. Both devices have the same processor and the same operating system, making the new variant completely software-compatible. The primary target application of the FRC-EP190 is integration with test benches in the automotive communications world. The FRC-EP170 was developed for use in vehicles. Its main application areas are gateway solutions for connection to different ECU integration levels, prototype controllers, expansion of data-loggers with additional interfaces, and wireless signal display using mobile phones or tablet PCs. Demanding Restbus simulation and gateway solutions can be implemented based on either device, using the corresponding software packages from the company. There are also development packages available for the development of specific solutions. Custom functions and applications can be implemented by customers in-house due to the use of the Linux operating system and the availability of a free Software Development Kit. A LIN interface is also available.